Dominica is an awesome place to study. Our students enjoy learning in a beautiful state of the art facility in the heart of the city of Roseau, the capital of Dominica. Dominica (pronounced “Dom-in-eek-a”) is an island of volcanic origins located between the French islands of Guadeloupe and Martinique in the Eastern Caribbean, at approximately 15 degrees North latitude and 61 degrees West longitude.It is the largest and most mountainous of the Windward Islands, with an area of 289.5 sq. miles (754 sq. km). It is 29 miles long and 16 miles at its widest. The formal name Commonwealth of Dominica is often used to avoid confusing it with the Dominican Republic. Dominica’s population is around 71,727 (2003), of which 20,000 live around the capital city, Roseau (pronounced ‘Ro-zo’), which is located on the south-west coast. English is the official language but a French-based Creole (kwéyòl) is widely spoken, especially in outlying villages. Visitors should bear in mind that the import and export of fruit, vegetables and flowers is restricted; you will need to obtain a license to take out flowers, for example. From the lush mountain peaks rising to almost 5,000 ft. to the underwater volcanic craters with dramatic vertical walls, it’s no wonder Dominica will take your breath away at every turn. Dominica is one of the best places in the Caribbean to dive, whale and dolphin watch, hike, bird watch, explore a pristine rainforest, or simply relax. Dominica is known as the “Nature Island” of the Caribbean. It was also chosen as the location for the filming of the major box office hit movie “Pirates of the Caribbean”. In Dominica, you will experience the world as it was meant to be – unspoiled and with natural wonders found nowhere else in the world. Dominica is a leading dolphin and whale watching hot spot. If sitting by the beach all day sounds a bit dull, then Dominica is the spot for you. Dominica is a paradise for the outdoor adventurer interested in unspoiled natural attractions. There is so much to do! Dominica’s Morne Trois Pitons National Park was the first UNESCO World Heritage Site in the eastern Caribbean. Electricity is 220/240 volts, 50 cycles. Public Transport is readily available in the form of the ubiquitous mini-bus (look for number plates that begin with ‘H’); the Old Market in Roseau is the ‘terminus’ for buses travelling south; the West Bridge for those travelling north. Fares are set by the government. 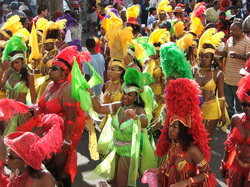 Dominica is home to a wide range of people. Historically occupied by several native tribes, only a Carib tribe remained by the time European settlers reached the island.The dialect of Dominica also includes Cocoy and a French Patois. “Cocoy”, is primarily a mix of cockney english imported by English settler and with an infusion of African lingual. Cocoy is mainly spoken in the north-eastern part of the island. The French patois which is more widely spoken came from the French plantation owners from the neighbouring French islands of Guadeloupe and Martinique. Some plants and animals thought to be extinct on surrounding islands can still be found in Dominica’s forests. For those of you interested in Dominica’s human history there are remnants of forts at The Cabrits up north and Scott’s Head in the south and many english and french place names throughout Dominica – a testament to the intense fighting that took place here over two centuries ago. There is a so an excellent museum in Roseau that documents Dominica’s Pre-Columbian history too and The Old Mill and Cultural Centre at Canefield – built in 1774 this historic sugar mill also housed the famous Rose’s Lime Juice plant and is also is a centre for the Arts. Dominica has plenty to see and can best be enjoyed by combining your sight-seeing escapades with a combination of both vehicle and on foot. It is most rewarding when you get stuck right in! WHALE WATCHING: There is a resident group of whales for which Dominica is home. These are joined by migratory whales between November and March providing excellent sightseeing opportunities. Excursions on comfortable boats are easily arranged and a list of tour operators is available from the Tourist Board (see bottom).